Are you being productive or are you simply being busy and wasting energy? Jennifer Bridges, PMP, shows you the difference in this instructive video on how to be really productive. Do you feel as if you’re running around all day, Jennifer asked? You’re moving from one to-do list to another and getting nothing done. What does it mean to be busy? It’s having a great deal to do, of course. People always says things like they’re busy as a bee. But bees get the honey. What are you accomplishing? Sometimes being busy is really about having a lot of work and reaping few results from it. That’s a trap. You’re just wasting time, money and energy. Instead of being busy, what you want is to be productive. Productivity is when your work produces a significant amount of something. It’s getting results with little work and the right tools—not overworking and underperforming. Think of the 80/20 rule, which means that 80% of your results comes from 20% of your work. That means recognizing which work will offer the biggest impact. That’s being productive, instead of keeping busy and losing productivity. What it means is saving time, money and energy, while doing work more efficiently. It’s an important time management strategy. Work smarter, not harder. This is an umbrella term that covers all that follows because productivity isn’t working the hardest you can, but the most effective you can. Use tools and templates to help you work, as tools are designed to make the work more efficient, and templates often set you up so you can avoid the busy work that can sap your productivity. Create repeatable systems as another means to streamline your work: there’s no reason to always reinvent the wheel. Set boundaries and know how to say no, because distractions keep you busy and don’t add to productivity—they only burn you out. Apply proven techniques, such as prioritizing. Get quick tasks out of the way first, breaking down large work assignments into manageable smaller chunks. Pro-Tip: Now that you’re ready to work more effectively, how can you tell if you’re progressing productively? There are ways to measure productivity, such as having a list, assessing your tasks and getting feedback. Take it Further: Sometimes all you need to do to boost productivity is to say the word no. Learn how saying no can boost your productivity. 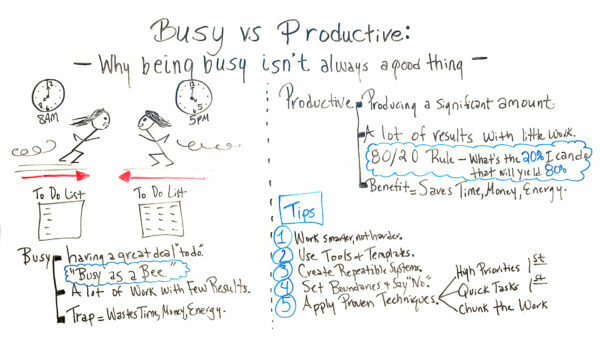 Today, we’re talking about busy versus productive, and why busy isn’t always a good thing. Well, sometimes we see people running through their day from 8:00 a.m. to 5:00 p.m. They’re running back and forth. They’re not even sure which way they’re going. And by the end of the day, their to-do list actually gets longer. So let’s take a look at the word “busy.” “Busy” is having a great deal to do. You hear people going around saying, “I’m busy as a bee.” Well, again, that means a lot of work is being done with few results. Some of the traps are that by doing this, you can waste valuable time, even money and energy. So this is important if not only you’re leading initiatives, but also teams of people who are responsible for generating results. So instead, let’s look at the word “productive,” and talk about a few tips that we can help, not only ourselves, but our team to get more done. So the word “productive” means producing a significant amount. So we see now, a lot of results are generated with little work. It reminds me of the 80/20 rule where we look at and we focus on, “What’s the 20% I can do that will yield 80% of the results?” The benefit of being more productive is it can save time, money, and energy. So let’s look at a few quick tips. And also use tools and templates. By using tools, it can help us generate data, get data reports faster that can help us in decision-making, helping us track things more efficiently. Also, templates can save us time. Because by using templates, we don’t have to recreate those every time. We can create repeatable systems. And when we create repeatable systems for things we have to do ongoing, by being repeatable, it helps us to actually get more efficient. We can see where the gaps are, and we can continue to try to get better each time we do it. Then, apply proven techniques. There are techniques that people use where some people choose to work on the highest priorities first, so they can ensure, by the end of the day, they get those done. Some people like to tackle and complete the quick tasks first, just get them out of the way, so they can later focus on the bigger and more higher-priority items. And then some people like to chunk like work, where different types of work, they chunk it together and say, during a specific period of time, they’ll do that. For instance, some people will chunk administrative-type tasks earlier in the day. Some people may chunk those and do them at the end of the day. So these are just a few quick tips. And if you need some tools and templates to help you be more productive, then sign up for our software now at ProjectManager.com.